The R-PLEX Human Endoglin Antibody Set includes a matched capture and detection antibody pair and calibrator for the quick and easy measurement of Endoglin in biological samples. R-PLEX products leverage MSD’s electrochemiluminescence technology for better sensitivity and a larger dynamic range than traditional ELISAs. R-PLEX matched antibody sets enable the development of singleplex and multiplex immunoassays. Individual assays may be developed using MSD avidin- or streptavidin-coated plates. Custom multiplex assays with any combination of R-PLEX analytes, as well as R-PLEX plus U-PLEX analytes can be developed on U-PLEX MULTI-SPOT plates. To learn more about the advantages of R-PLEX products click here. 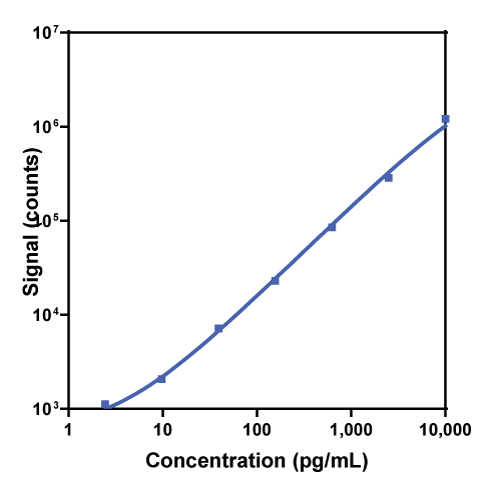 Calibration curve for the R-PLEX Human Endoglin Antibody Set was assessed and representative data is presented below. Description - Endoglin (CD105, END, HHT1, ORW1, ENG) is a type I integral transmembrane glycoprotein and is an accessory receptor for TGF-β superfamily ligands. Endoglin is highly expressed on vascular endothelial cells, chondrocytes, and syncytiotrophoblasts of term placenta. It is also found on activated monocytes, mesenchymal stem cells, and leukemic cells of lymphoid and myeloid lineages. Endoglin is involved in the regulation of angiogenesis. Disease Research Area - Angiogenesis, Hereditary Hemorrhagic Telangiectasia (HHT).